They are great and they were all very professional. They were easy to work with and really quick to respond to requests. The moving quality was good. They were on time, and overall, all in all, it was good. It felt like they were pretty trustworthy. Joshua’s Moving & Packing Services LLC provides a complete range of moving services for residential and commercial clients throughout the Greater Bay Area. The company has the training and equipment to move everything from standard boxes and household furniture to oversized items like pianos. 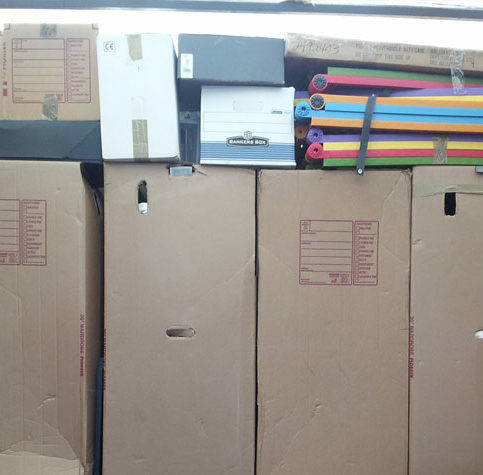 Additionally, Joshua’s offers packing services, sells moving boxes and has storage facilities for its customers’ convenience. 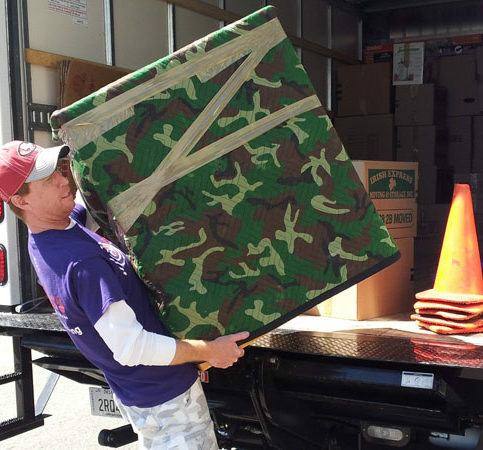 A Joshua’s Moving & Packing Services employee loads a customer’s belongings into a moving truck. Joshua’s Moving & Packing Services has been providing residential and commercial moving services for clients throughout the Greater Bay Area since 2012. 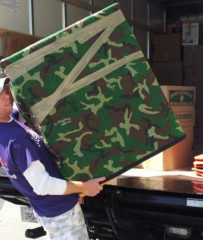 The company’s technicians are trained to move everything from standard boxes and furniture to oversized items like pianos, and they also offer packing services for the convenience of their customers. When planning to move large furniture via an upper-story window, you’ll need to determine whether hoisting or crane-lifting will be a better method. Many multi-story homes and apartment buildings have limited access due to narrow doorways and staircases. When moving into (or out of) such a location, large furniture pieces may need to be lifted through a window or balcony. There are two methods that can be used for lifting large furniture: hoisting or lifting via a crane or hydraulic lift. While crane-lifting is self-explanatory, not everyone knows what hoisting involves. Basically, hoisting is like crane-lifting but without the crane. Typically, it requires a minimum of three movers: two to raise or lower the piece and one to operate the tether strap to keep the piece steady while it’s being moved. Hoisting is a delicate and extremely dangerous procedure that should only be performed by professional movers. Due to safety risks, there are limits to what can be manually hoisted. Only so many movers can fit on a given landing, and excessive weights can damage railings and window frames. To ensure safe transport, any items weighing more than 250 pounds should be moved using a crane or hydraulic lift. In general, for locations higher than four stories, it’s best to use a crane or hydraulic lift for lifting furniture pieces. Hoisting requires a lot of work, as every piece needs to be wrapped in protective padding beforehand, which is why moving companies usually charge per piece for hoisting. Since crane-lifting doesn’t require as much preparation, it can be a more affordable method if you have more than five pieces that need to be lifted. A: We recommend booking as far in advance as possible to ensure availability. Most of the moves we do are booked two to three weeks in advance, but if you’re planning to move during a high-demand time like a weekend or the end of the month, it’s a good idea to book further ahead. Q: What should I do with items I plan on moving myself? A: We recommend putting items that aren’t being moved in one area of your home and clearly marking them with a sign. A: Yes. Due to how fragile and expensive pianos are, it’s important to hire an experienced professional when moving one. We have a lot of experience moving pianos, including crane-lifting them in and out of upper-story buildings. Q: I live on a road with limited access. Will your truck fit? A: We can look up your address online or go by in person to assess the situation. If it looks like there’s going to be an issue due to limited access, we can plan to bring a smaller truck. Q: Do you offer storage services? A: Yes, we have a large storage facility at our main office in Pacifica. SAN CARLOS — Prior to moving a piece of furniture, take steps to protect it from damage during transit. First, remove any detachable parts, such as table leaves and chair legs, and wrap these separately. If you feel so inclined, it’s also a good idea to clean your furniture before moving it. 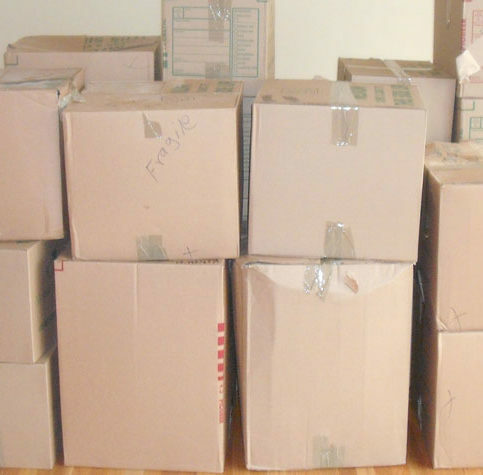 The method for packing a piece of furniture varies depending on what material it’s made of. For example, wood and leather pieces should be wrapped with paper or cloth padding before plastic wrap is applied. This will allow the plastic to breathe and prevent “sweating” caused by trapped moisture, which can potentially lead to warping or mildew. If you’re moving a fabric item of furniture (such as a sofa), it isn’t necessary to apply paper or cloth padding before wrapping it in plastic. However, if the item has any sharp corners, it’s a good idea to cover these with cardboard to provide some extra protection. Wrapping is easy—just hold the roll of wrap at the center and walk around the item. With each trip around, you’ll add a new layer of plastic, until it’s completely covered from top to bottom. Once the item is wrapped, cover it with one or more packing blankets. Use tape to secure the blankets in place. Finally, re-wrap the item in plastic from top to bottom. Once you’ve finished wrapping, it’ll be ready to move. SAN CARLOS — Host, Sarah Rutan: Prior to moving your sofa, you’ll need to take steps to protect it from damage during transit. Today we’re in San Carlos with Diamond Certified Expert Contributor Joshua Rengifo of Joshua’s Moving & Packing Services to learn more. Diamond Certified Expert Contributor, Joshua Rengifo: Welcome to Joshua’s Moving. Today, we want to show you how to wrap sofas, especially when you have a sofa’s color light. It’s very important to put first the shrink wrap or plastic around. You can cover. And after that, you can use the parts. Why we use that shrink wrap first – because sometimes, we use too many times to the paper parts. That’s why it’s very important to cover first with the shrink wrap first or plastic. And after that, you pull it apart and cover again, and wrap it up again with tape and shrink wrap. This is everything you need to know how you can wrap the sofas. Joshua’s Moving & Packing Services, LLC : Average 8.9 out of 10 based on 100 unique customer surveys of customer satisfaction. They did good work and they made good use of their time and my money. I would like to adopt them as my family, they were very nice people and easy to deal with. They are nice people to deal with and they seem very honest. They are the best, use them. They were responsible and reliable and careful with our stuff. They didn't break anything. We could really trust them. They showed up on time and the packing was quick and there wasn't any damage. I wouldn't use anyone else, ever. I would give them a "12". He has never told me no and he has always sent very hard workers. He has never turned me down with last minute requests. I have a very difficult client and he never fusses at her requests. There is nothing better than them. They got the job done and they did well. It was just very easy to take care of my packing and everything. I just thought it was easy and they did everything I needed. They are responsive and thoughtful and terrific and good and detailed. Probably that they bring their big muscles and big heart to every move. They were very friendly and very accurate and they were fast. The overall experience was very smooth. They were efficient, pleasant, on time, and they just got stuff done and they weren't needy. They knew what to do. I like that it is a local company. I think I called them pretty last minute and I was maybe 10 months pregnant at the time and they helped me move stuff around and pack up the last bit of stuff. They really did help and when we got to the new place, they were helpful and they put things where they needed to go. They were on time and very helpful. They are very efficient and they come in on budget and they are very friendly. I like that they also work really well with their clients' schedules. They are professional, efficient, and quick. They are very reliable, fairly priced, and delightful to work with. They are very careful about how they move things in and out of your house. The overall experience is pretty good.